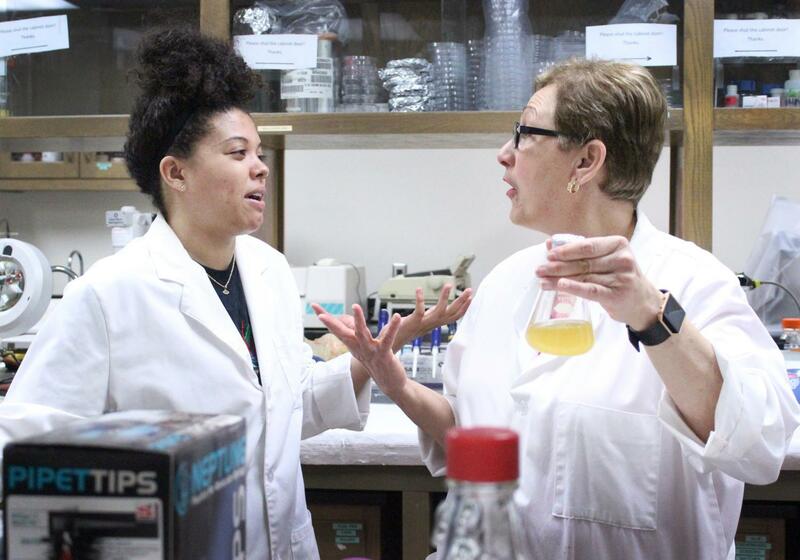 Magaly Rincon-Zachary, biology professor, talks with one of her students, Mi’Kaila Billinger, biology and Spanish junior, about the EURECA research project they are working on in the lab, about the results they’ve gotten so far and possible directions they could go forth with, April 11, 2018. A white male and an American-Indian woman are sitting at a table in the Mesquite Dining Hall – both are staff on campus. They both teach. They both hold office hours. They both advise students. They do the same job and the casual observer might assume they are paid the same. However, one makes more than the other. But not for the reasons that might come to mind. While stereotypes of gender and ethnicity pay gaps exist in the workforce, both have little bearing on campus salaries according to some faculty, although data obtained by the MSU Office of Administration and Finance do show some differences. “The key factor is our area of expertise,” Ronald Young, associate professor of accounting and management information systems, said. Young, who joined campus staff in 2015, tops the list of highest paid associate professors in the accounting department not serving in an administrative role, making $134,653 annually. His female counterpart, Susan Anders, makes $127,442 and also joined staff that same year. Some faculty members said younger faculty members were being hired at higher salaries than those who had been here for a long time, sometimes decades. In fact, newer employees do tend to make more than those employed at MSU for decades. Only 35 percent of the time did longevity correlated with salary. “Midwestern was wanting to add a program in energy management and there just are not many accounting professors who know a lot about the oil and gas industry. I happen to be one of the few that does. And so well at the end of the day, basically I’m getting paid as much as I can get out of them,” Young said. Some gender differences were apparently. 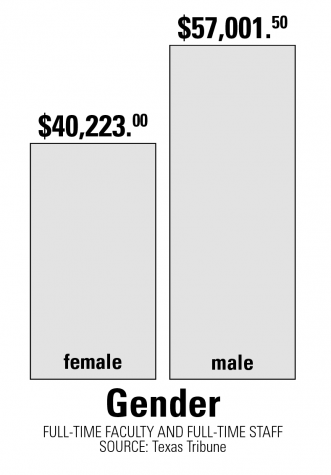 The median female salary is $40,223 annually while the median male salary on campus is $57,001. However, many more males have been employed at MSU for a longer period of time explaining at least part of the difference. Young said a person’s title should also be taken into consideration. And, for both faculty and staff, those with higher ranks were paid more, often significantly more. “The professorship contributes a chunk of our salary and so the professorship I’m under may have been better funded than the one she’s under. I don’t know that but that’s certainly a possibility,” he said. Campus data shows that on average, associate professors make $75,279 annually and men hold 31 out of the top 50 spots. But Young said in higher education, especially in accounting at the university level, salary inversion or situations in which the starting salaries for new recruits to an organization increase faster than those for existing employees is also another important factor. While Anders stands as the highest paid female faculty member, Jeffrey Stambaugh, dean of Dillard College of Business Administration and associate professor of management, is the highest male faculty member, racking up $149,988 annually after 10 years of employment. Laura Peterson, assistant director of UVI development for donor services and scholarships, has the female yearly median salary of $45,775 for assistant directors on campus. “At MSU it’s really hard to compare jobs even with the same title as assistant directors because responsibilities can vary so greatly [and] I think responsibilities would play a role in that,” she said. Trey Reed, assistant director of athletics for sports information, is the highest paid male assistant director with $53,076 after joining faculty in 2007. Crystal Boyle, assistant director for continuing education, is the highest paid female assistant director with an annual salary of $54,000. She began in 2005. Ruth Morrow, music professor and Bolin distinguished chair of piano, teaches her Tuesday/Thursday 8 a.m. Introduction to Western and World Music, in Fain Fine Arts Center Room C111. Admissions Assistant Director Hugo Erazo who has the median male salary of $42,221, said, outdated job descriptions can greatly affect a salary. Ruth Morrow, Bolin distinguished chair of piano and professor of music, said sometimes it’s hard to tell if gender is a factor because every hire is individual and there has been a change in administration on every single level. Morrow who makes $79,059, said her concern is with compression or the small difference in pay between employees regardless of their skills or experience. While faculty and staff shared views on gender, the idea of ethnicity influencing salaries was not popular. Eighty-seven percent of the individuals employed on campus are white accounting for all three maximum $310,000, minimum $13,250 and median $47,922 salary for employees. Neither of the highest paying salaries for each ethnicity in the remaining thirteen percent reach half of the highest salary for white employees. 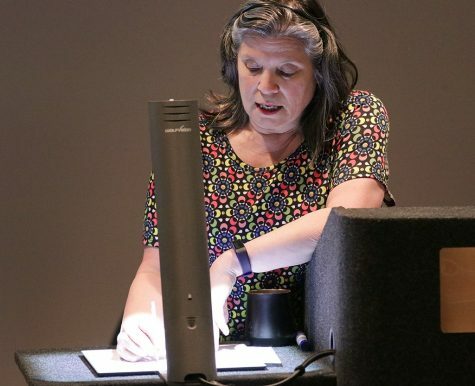 Morrow who is the highest paid American Indian with an annual salary of $79,059, said her doctorate, performance on the job and overall experience is what earned her her salary. The highest paid American Indian / Alaskan Native is political science lecturer, Kyle Keel, who is paid $40,000 annually. “People just assume the highest paid person would be a white male,” Treva Clifton, assistant to the president, said. 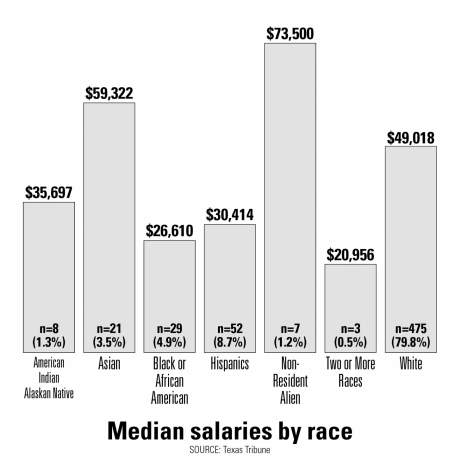 Clifton makes the median salary for all white employees of $47,922 annually. She assists University President Suzanne Shipley, the highest paid person on campus who earns $310,000 annually. Clifton said she earned her salary because of her experience. She started as secretary II, following which she became administrative assistant, the dean of students’ assistant, the vice president’s assistant and now the president’s assistant. “I am good where I am. Everyone wants a raise but the budget has been set for the year although the benefits outweigh a higher paying job without those benefits,” Clifton said. Nelson Haggerty, men’s basketball head coach, is the highest paid African-American male earning $119,658 annually, while Michaelle Kitchen, associate professor of counseling, is the highest paid black or African-American female earning $79,075 annually. The highest paid Hispanic male is Martin Camacho, dean of Fain College of Fine Arts and associate professor of music, who makes a yearly salary of $124,860. Highest paid Hispanic female is Magaly Rincon-Zachary, biology professor and director of undergraduate research, who makes a yearly salary of $104,980. 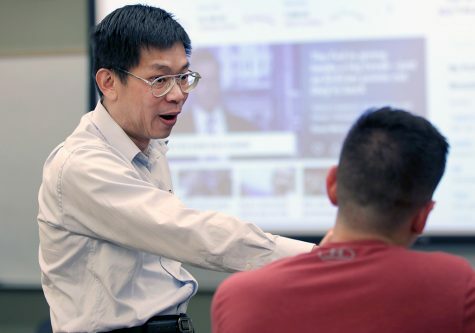 Adam Lei, Bridwell distinguished professor of finance, answers Eric Gamboa, finance junior, question about bonds before class at Dillard on Wednesday, April 18, 2018. As the highest paid Asian staff member on campus, Yung-Chou earns an annual salary of $124,599. The faculty in the finance department has some of the highest paid faculty on campus. He said his ethnicity has not affected his ability to teach and although his accent has created some difficulty from time to time, students have gotten accustomed to it. But Assistant Director of Admissions Hugo Erazo said ethnicity does have some impact on salaries.